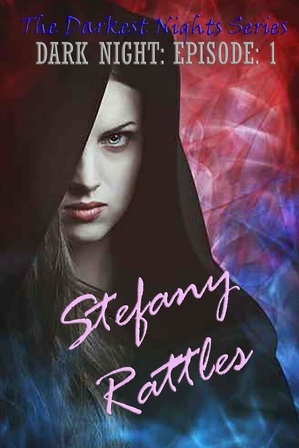 The Darkest Nights Series - Welcome to Stefany's Website! Seventeen year old Mia Dawney was an ordinary girl who had lost her parents and had moved to Maine and into the Castle High boarding school. On the night of her birthday, Mia senses that something is off. When she goes off to look for her friends she runs into a stranger that turns her world upside down. Months later, Mia is with a group of people that had gone into hiding. Something is out there and Mia knows that “they” are not human. But Mia is experiencing vivid dreams and other odd side effects that she shrugs off. Until the day she goes on a raid and gets caught by “them”, she is left behind by her group to fend for herself. Who are they? Why do they want Mia? Life is changing for Mia Dawney. In this second episode of The Darkest Nights series, Mia is dealing with how she needs to accept her new life and the rules it comes with. Meanwhile, a connection has built between Mia and Robert that they can't seem to control. Mia Dawney is now at the Dark Night Institute and she's learning things about the school and classmates that she finds fascinating and scary all at the same time. She also runs into an old friend there and she also learns that there's a lot more to the school that meets the eye. In the last episode of the first part of The Darkest Nights Series, Mia and Robert face their demons in more ways than one. Mia makes several shocking discoveries. Robert deals with his relationship with Genevieve as visitors arrive at the institute. A ceremony commences... while foes and enemies are revealed. Don't miss this last episode of the year! The Darkest Night's Series Part 2 picks up after the events of Dark Night: Episode 5. There's change in the air. Mia and Robert can finally date... or can they? There's definitely tension at the Dark Night institute and it has to do with more than just Mia and Robert's relationship. Chaos is brewing and it's only a matter of time before Mia and Robert end up in the middle of it. Find out what this next episode has in store for you in Blood Thirst!